1. The pest technician should be qualified in Pest Control and Termite Work. 2. Termite Technician should be fully Insured for Public Liability and Professional indemnity. We are insured with WALLACE INSURANCE. Our BSA number is (639161). 4. It is ideal to hire someone with experience in the field. Ask your technician how long they have been working for? And what other companies have they worked for? 6. What warranty is provided on the termite treatment ? 7. What is the annual inspection cost to keep the 8 year warranty valid? Don't employ someone who is going to run in-and run out! Chances are, they won't complete a quality job! sleepers, fence posts, logs & trees etc in the quoted price?? 1. Which chemical will they use? 2. What concentration of chemical will be used per 100 litres of water? 4. Approximately how many litres of chemical the total job will take. 6. Will concrete holes have plugs or mortar on completion? 7. Will the termite technician perform a 'double run' when injecting chemical? Will they add a foaming ingredient? 9. Has the termite technician provided a free termite inspection in the treatment price? FINALLY: we encourage you to become involved in the treatment!! place the correct amount into the tank. We are happy for our customers to take samples of the chemical at any time. A termite treatment is a big investment!! Performed properly - it will last a long time - at least the warranty period!! 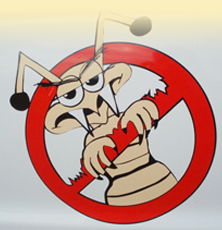 Performed badly - it can fail allowing termites to re-infest your home!